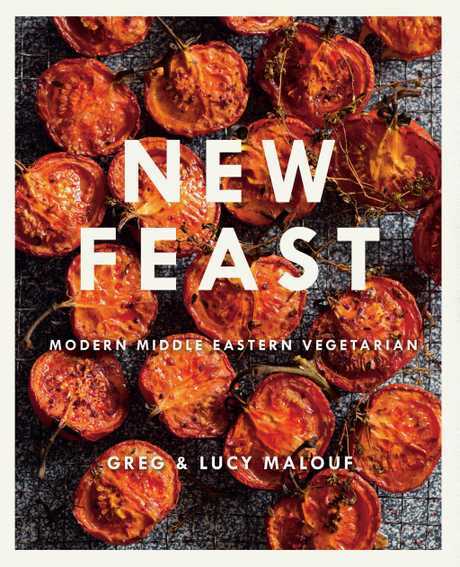 GREG and Lucy Malouf's cookbook, New Feast, celebrates the delicious, home-style, vegetarian cuisine of the Middle East. Breakfast, breads, butters and preserves, dips and spreads, pickles and relishes, soups, vegetable salads, fritters, stuffed vegetables, savoury pastries, cakes and cookies, ices, desserts and more - they're all covered with modern interpretations of this cuisine. "As you'll discover from this collection,” says Greg, "austerity and denial have no place in the Middle Eastern approach to eating - with its emphasis on sharing, and on combining a variety of dishes of varying tastes and textures it is exciting and satisfying on all kinds of levels. Recipes include: feta cheese straws with Turkish chilli; pear sorbet with Prosecco, cardamom and lime; slow-roasted eggplant with saffron-lemon cream; and roasted tomato and chickpea curry with coconut and coriander. To make the apple jelly, soak the gelatine leaves in a dish of cold water for a couple of minutes, until soft and slippery then squeeze them to get rid of any excess water. Heat up 50 ml of the apple juice and whisk in the gelatine until it dissolves. Mix it back into the rest of the juice then pour into a small shallow container and transfer to the fridge to set. To make the pavlovas, preheat the oven to 120C and line 2 large baking sheets with baking paper. Put the egg whites into the scrupulously clean bowl of a stand-mixer. Add 2 tablespoons of the caster sugar and the salt and whisk on a slow speed until the mixture begins to foam. Increase the speed to high and whisk until the foam thickens to form smooth, soft, glossy peaks. Sift on the remaining caster sugar, a little at a time, whisking as you go, to firm peaks. Finally, sift on the icing sugar and cornflour and whisk in briefly until incorporated. Spoon the meringue into a piping bag fitted with a 1 ½ cm nozzle. On each of the prepared baking trays, pipe 4 pavlova 'flowers', spacing them well apart. Start with a walnut-sized central blob, then surround it with 6 more blobs, to form pretty flower-like meringue nests. Aim to get the peaks of the outer blobs pointing inwards, if you can. Use a knife to flatten the central meringue; this will form a base for the filling. If you feel the flowers are beyond your piping skills, then form the traditional swirled meringue nests. 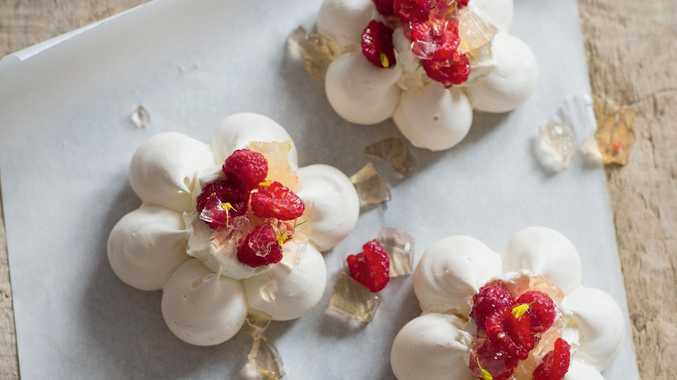 Bake the pavlovas for 1 ½ hours until they are ivory-coloured and crisp. Leave to cool on the baking sheets for 10 minutes before carefully lifting the meringue flowers on to wire racks to cool completely. When ready to serve, cut the jelly into small cubes - they don't have to be precise. Fill the central cavity of each meringue with a generous spoonful of vanilla labneh. Top with fresh raspberries and a scattering of jelly cubes. Add a splash of rosewater and serve straight away. Note: Alternatively, use 1 g (½ level teaspoon) agar powder. Mix half the apple juice and the agar in a small pan. Bring to a boil. Simmer for a few minutes, stir in the remaining juice and set in the fridge. For the soft-strained vanilla labneh, mix the honey and vanilla seeds into the yogurt and scrape into a clean tea towel (a muslin square or new J-cloth will also do nicely). Tie the four corners together to form a hanging bag. Twist firmly to give it a good squeeze and kick-start the draining process. Suspend the bag from a wooden spoon set over a deep bowl and allow it to drain in the fridge for at least 4 hours or, preferably, overnight. The longer you hang it, the thicker it will be, but you can always thin it to a looser consistency, if necessary, with a little fresh yogurt or cream.